McSharry at the Irish Open Swimming Championships in April. MONA MCSHARRY SMASHED a fourth Irish record in the space of just three days on Saturday morning, breaking her own record for the 100m individual medley at the Irish Short-Course Swimming Championships in Antrim. The Sligo native has continued a week to remember having already broken the 50m Freestyle record on Thursday, taking gold in the final, while also prevailing in the 200m Individual Medley. On Saturday the Marlins SC swimmer broke her own record for the 100m individual medley — previously standing at 1.00.66 — with a new time of 1.00.34. 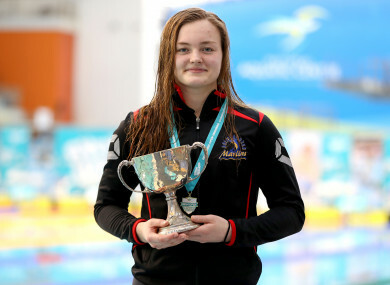 Having secured the 50m Freestyle and 200m Individual Medlay titles on the opening day, McSharry twice broke Michelle Smith’s record in the 100m Freestyle which had stood since 1995. Email “Sligo's 18-year-old swimming sensation breaks fourth Irish senior record in three days ”. Feedback on “Sligo's 18-year-old swimming sensation breaks fourth Irish senior record in three days ”.